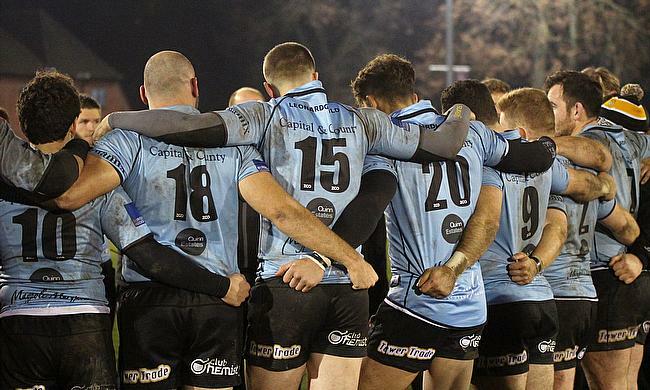 Canterbury will be looking for revenge this weekend after losing to Redruth 14-10 earlier in the season. Rivals Taunton Titans (3rd) and Henley Hawks (4th) were set to face each other in Round 21, but their game at Dry Leas has been postponed. Canterbury could move six points clear of the chasing pack with a bonus-point victory, but they face a Redruth side who have won two of their last three games since Nigel Hambly came in as Director of Rugby. Tonbridge Juddians may also be able to exert some pressure on their promotion challengers as Peter Dankert’s men go to Barnes this weekend and TJs are only six points behind second place. League leaders Rams RFC will be looking to take another step towards the National Two South title when they travel to Guernsey, but the Channel Islands outfit won’t roll over despite their league position. Jordan Reynolds’ men are in the bottom three, however, two consecutive wins has breathed new life into their survival bid and if they were to upset the applecart this weekend, it could arguably be the result of the season so far. Guernsey occupy the relegation spots with London Irish Wild Geese and Birmingham & Solihull and both of those sides have home fixtures against Worthing Raiders and Clifton on Saturday. Elsewhere, Bury St Edmunds entertain Old Redcliffians while Old Albanian v Dings Crusaders has been called off. It was a performance to match the occasion. Rams RFC produced a professional and ruthless display to defeat Barnes in Round 20 as Seb Reynolds’ side claimed a record-breaking 16th consecutive win for the club. The National Two South leaders have been scintillating this term and with 10 games to go in the season, they sit 16 points clear at the summit. Promotion and the title may well be a forgone conclusion for the Rams, but for their opposition this week, they have to continue battling. Guernsey welcome the table toppers to Footes Lane in a rejuvenated mood as Jordan Reynolds’ side have breathed new life into their season. Their fight for survival as been boosted after successive wins over Barnes and Clifton so the Raiders now sit 13 points from safety. There is still an awful lot of work for Guernsey to do, but another positive result against the runaway leaders would keep their hopes of avoiding the drop alive. Canterbury enter February sitting in second place in National Two South, but despite remaining in the play-off position following their recent win against Worthing Raiders, the City Men will be hoping for an improved performance when they host Redruth in Round 21. Andy Pratt’s side had to work extremely hard to claim a bonus-point victory last weekend and with their fellow promotion candidates also picking up wins, Canterbury know they must continue to keep their cool. The Kent outfit sit one point clear of the chasing pack as things stand, while Redruth surged into sixth place after coming through an intense battle against Birmingham and Solihull last time out. However, the Reds Director of Rugby Nigel Hambly was far from impressed with his sides ‘ill-disciplined’ display despite securing back to back home wins for the first time since October. He will be keen to see a much more polished performance on the road this weekend as Redruth aim to end a three match losing-streak away from the Rec. Without doubt, Tonbridge Juddians are in the play-off conversation. A hard-fought victory over Bury St Edmunds last weekend means Peter Dankert’s side are six points behind the top two and their remarkable run of recent form has kept them in touch with the leading pack. TJs have lost just one of their last 12 matches, which is a run that stretches back to the middle of October, and they will fancy their chances of maintaining their momentum when they take on Barnes this weekend. After three weeks of high drama, there was to be no late histrionics from Barnes in Round 20 as they felt the full force of league leaders Rams RFC at Old Bath Road. The London-based side were comfortably beaten and it is now just one win from their last nine fixtures. Barnes also dropped to 13th place in the league standings last Saturday, but they may come into this clash with TJs harbouring fond memories of the reverse fixture earlier in the season. Barnes snatched a 21-20 victory so the visitors will be hoping for a similar outcome as they look to improve upon their recent run of results. For the second away game on the spin, frustration would have been the dominant feeling in the Bury St Edmunds dressing room. After controlling large potions of last week’s game against Tonbridge Juddians, Nick Wakley’s side couldn’t convert their pressure into points as they fell to a defeat at the Slade. However, the Wolfpack did produce another encouraging display as they look to continue building under Wakley, who has recently hinted at extending his stay with Bury. Back in Suffolk is where Bury will be keen to improve, first and foremost. They have won just one of their last seven home matches and they will be fully aware of the challenge their visitors will pose in Round 21. Old Redcliffians arrive at the GK IPA Haberden having won five of their last seven games which has enabled Saul Nelson’s side to pull clear of trouble. Old Reds are now 14 points above the drop zone and the Bristol-based side will be keen to extend their wonderful recent form this weekend. Following a very encouraging start to the New Year, Clifton would have been majorly disappointed by their result and performance against Guernsey last weekend. Matt Salter’s men were beaten by a late Owen Thomas penalty as the Lavender and Blacks suffered a defeat at Station Road, but the eight-placed side will be aiming to bounce back on Saturday. Clifton visit Birmingham and Solihull who fought valiantly against Redruth in Round 20 to earn a losing bonus-point. The Bees are currently bottom of the division and 16 points adrift of safety, but their performance at the Rec, alongside their recent home displays, does give Pete Glackin’s side some encouragement as we enter the final third of the season. The Midlands club have won their last two fixtures at Portway and a hat-trick of victories would just add fuel to Birmingham and Solihull’s survival bid. Old Albanian’s miserable run of results continued in Round 20 as Gavin Hogg’s side lost out to Old Redcliffians. The side relegated from National One last year have really struggled to put together a consistent performance for 80 minutes and that is what has held the Hertfordshire outfit back. OAs now sit in ninth place and take on a Dings Crusaders side who will also be keen to return to winning ways this weekend. Luke Arscott’s men put in an excellent shift against promotion chasing Henley Hawks last time out, but failed to produce a cutting edge when they needed to be clinical. However, Dings would have taken positives in defeat and the Bristol outfit will now be keen to pick up an away victory to improve on their recent form of one win from their last six games. Worthing Raiders head coach Jody Levett told the West Sussex Gazette this week that his side need to focus on what’s behind them rather than what’s in front of them following three straight defeats. The Raiders are currently 10th in the table and 16 points clear of the bottom three, but Levett is keen for his side to secure their league status as soon as possible. Ahead of this weekends away game to London Irish Wild Geese we have Peter Gavin's pre match review. The men from Roundstone Lane did produce a decent performance against second-placed Canterbury last Saturday and they will be keen to build on that display when they travel to London Irish Wild Geese this weekend. While Worthing are eager to rubber stamp their position in this league for next season, the Wild Geese are aiming for the same goal, but the task ahead of them is a lot tougher. They are 15 points from safety as things stand, however, they have won their last two home matches. Could the Wild Geese make it a trio of triumphs at Hazelwood to keep themselves in touch with the safety positions?